Enamel is very decorative when it is applied to jewelry. From transparent, to opaque, to champleve enamel, to cloisonné, to plique-à-jour, to guillachiere enamel, to painted enamels, numerous pieces of jewelry own their grace to enamel work. Enamel use has never been limited to jewelry, and and it has been used to decorate other objects, such as pins, cigarette boxes, lighters, pens, plaques, clock faces and many other items. Unfortunately, even though enamel seems to be strong and durable, it is indeed fragile. It can chip easily, and the damages to enameled items are highly visible. We have developed proprietary techniques to restore the damaged areas, while preserving as much of original enamel as possible. We had restored the top right corner of this enamel painting, as well as cleaned the frame. We restore damaged works, ranging from jewelry to boxes and to any other type of enameled artwork. We restore not only one colour pieces, but also our experienced artists can recreate the painted enamel designs (flowers, faces, etc.) that are often present on jewelry boxes and plaques. 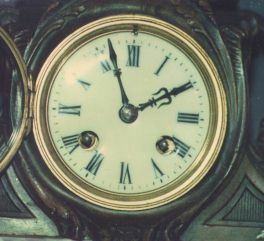 To preserve original work, we use "cold method" technique, which means that we do not re-fire the object because refiring can cause further damages to the original enamel. Using proprietary technology and advanced materials, we restore enameled works to perfection. We also offer "hot method" technique, application of new fired enamel. Enamel can be applied to almost any surface, metal in this case. 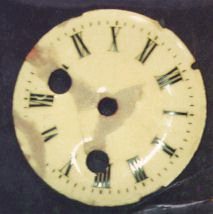 This clock face was broken and had enameled parts missing... Not after we finished our work! Another service we offer is application of enamel to bare surfaces. From the samples of our work you can see damages disappear. By holding these objects in your hands, you would not even suspect that any restoration was done. Our specialty is "invisible" restoration. The unique aspects of our restoration services is after we are done working on damaged object, the restoration work is not noticable with a naked eye! We preserve the original and our work is reversible.